Built of flint as a mission church in the parish of South Bersted in 1894 (KD/1899), this has stepped triplets of lancets along the sides and four west ones below a roundel and above a low narthex. There was originally a belfry with an overhanging spirelet, which was removed in 1977 (Elleray (2004) p43), though the brackets on which it rested are still visible in the gable. Inside, the side-walls have large wall arches, but it is not clear if it was intended to add aisles or if they were purely decorative. The architect is said to have been Sir A W Blomfield (CDG 8 (1894) p129), though none of his all too frequent mannerisms is in evidence. 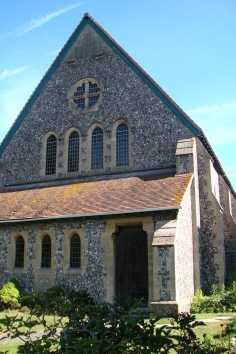 A small chancel was added around 1930 (church website) – the original chancel arch is still there. This was replaced in 1971 by a much larger one of brick, which makes no attempt to match the earlier work. The steep pitched roof comes close to the ground with long side windows divided into narrow lights and the mullions inside are variously coloured. This can hardly be the extension of 1956, said to be by N F Cachemaille-Day (TSJ 7 (1991) p27), for apart from the discrepancy in date, it is bears little resemblance to his work; it is unlikely that this was carried out. Nor can it bear any relationship to a scheme for repairs by S T Hennell in 1950-51, for which an application to the ICBS was rejected and which equally may not have been carried out. The fittings date from 1971, save the C19 font, which is said to come from a pre-1894 mission hall (CDG ibid). Since 2001 the area, a conventional district from 1983, has been a separate parish.